Can’t you imagine what blind dogs can do? Please watch our videos on YouTube. You can watch other videos on our YouTube channel. My blind Doxie Nono showing up in the videos isn’t special dog (of course, she is my precious dog). Also any blind dog can get to do a lot of things by her remaining brilliant abilities, your help and positive reinforcement training. 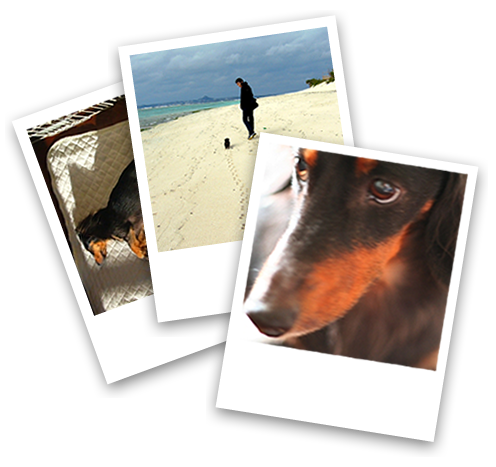 For tips and ideas for training and helping blind dogs, please see Blog and Resources. Blind dogs have brilliant abilities such as senses of smell, hearing, touch, and taste, intelligence, creativity, power of memory and so on. So they are the same full-vision dogs except only the eyesight. Blind dogs don’t give up. They accept and adjust the their disability, and are fully alive in each moment. They can find new ways to achieve a purpose and solve a problem by using their remaining abilities. Blind dogs can enjoy their lives. If there are your understanding and help, your blind dog’s life would be much more comfortable and beautiful. 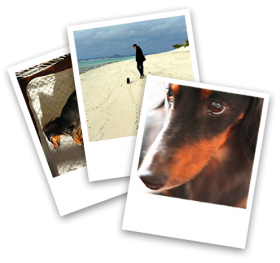 Many people think that training is a hard thing for dogs, especially for handicapped dogs. It isn’t true. By positive reinforcement training, we can develop a blind dog’s remaining abilities, create new ways that blind dog can depend on and substitute for the eye, and create plenty of fun activity and time for her. If you motivate your blind dog and make her want to do, she would get to do various things with having fun and develop a trust relationship with you. 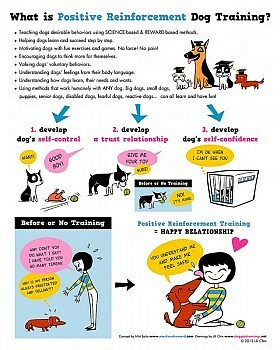 The following cute poster can help you to understand about positive reinforcement dog training. 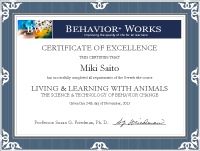 Click and read details if you don’t know well about positive reinforcement training. Blind dogs are brilliant and beautiful! You should look to what your blind dog can do but not to what she can’t do. We can help to improve a blind dog’s life with a little knowledge and ingenuity, and enjoy life together! Blind dogs teach us lots of important things in life and create countless positive impressions on us. How lucky can we live with blind dogs!